Enter the second season of "The Road to the WRC". Change the livery and the three colours of one of your cars in "The Road to the WRC". Enter the fourth season of "The Road to the WRC". 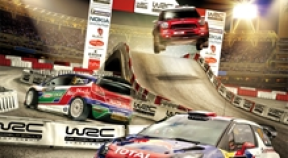 Complete an upgrade research in "The Road to the WRC". In "The Road to the WRC", increase the team level of development up to 23. In "The Road to the WRC", increase the staff level of efficiency up to 25. In The Road to the WRC, unlock the sponsor Rally Style. Beat the Man to be the man! Complete a Single Player - Single Rally match in first position with a WRC Group B car. Power is with you. Always. Complete a Power Stage in an offline Championship in first position. In Time Attack mode, complete a race against one of the ghosts you have downloaded. Let it be a lesson to you! Successfully complete one of the lessons in the WRC Rally School. Complete a Hot Seat - Single Rally match against three other players in first position. Win 10 Super Special Stages in Online matches. Create a Lobby in the "Create Match" page and start the race. Reach level 30 in the Super Special Stage Online Ranking. Reach level 18 in the Hall of Fame Online Ranking. Reach 30 cumulative minutes of race in valid Online Matches. Put down a cactus in Mexico. Enter the Photo Mode, take a photo and save it. Reach 225 Km/h (139 mph) on a Special Stage. Perform a jump of at least 2.5 metres (8.2 feet) in height. Reach 30 used manual respawns in the offline statistic page. In an offline Special Stage with P.Solberg, gain at least 5 positions from one sector to the next. Complete a Special Stage in first position using a Car Settings preset you've created. Successfully complete all the challenges in the WRC Rally School. In "The Road to the WRC" complete one of the Super Special Stage tournaments in first position. Complete a valid rally in Argentina, Australia, Jordan, Mexico & Greece in the same Championship. Complete a valid rally in Great Britain, Italy, France, Spain & Portugal in the same Championship. Storm all the challenges of the WRC Rally School. Reach level 50 in the Super Special Stage Online Ranking. Reach level 50 in the Hall of Fame Online Ranking. In "The Road to the WRC" achieve Reputation Level 70. In "The Road to the WRC" complete the first rally of the WRC Championship. In "The Road to the WRC" complete the WRC Championship in first position. Complete all the events of "The Road to the WRC" in first position.